Does anyone have a colored or crystal DC shell they want to sell? Ideally in MINT condition but I'm open to anything. These things seem to be fetching crazy money on eBay and to be honest they are not worth it, for a few dollars more you could get a genuine limited DC like the R7 or Hello Kitty editions. Thats over $100 ......for a shell and its used! There is a solid black one on ebay.co.uk but is just a SEGA sports one. I am looking for one aswell. Wow, they really go for a lot of money? I got 3 of those. Of the ones in the first picture, I have a purple and a blue one. Of the one in the second picture, I have a black one. And no, it's not the Sega Sports black one. It's the Japanese black one. it's because the first picture is of 3rd party shells while the second is of an official Sega. The Sega ones came with a Dreamcast sticker and had SEGA printed on the front. They also came only with the top half of the shell. because the top is not compatible with the Sega bottom. 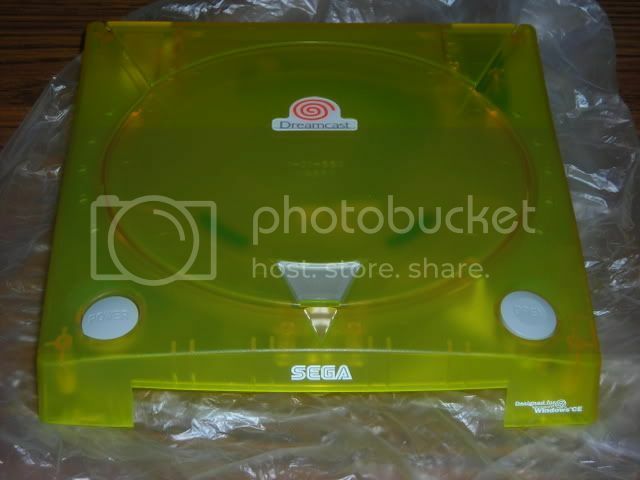 buy a broken dreamcast and paint the shell.